Earlier still were Egyptian gardens, formal and geometric; a plan from circa 1400 BC includes a mile-long canal, storage pools, fruit trees and vineyard. 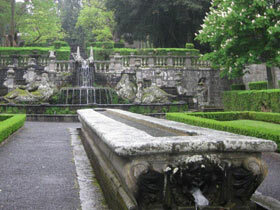 When slim - only 15cm wide or less - rills intrigue us; wider ones invite us to dip in a finger or toe - as at the Renaissance Villa d'Este near Rome where a raised rill acts as a balustrade and a hand may be trailed along, or at the Villa Lante near Viterbo (Italy) where I love the stone table with a rill along its centre (for keeping wine cool) and the rill at the feet for dipping. 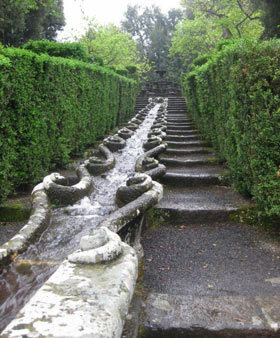 Here, with fountains and rills, water is the `ultimate philosophical instrument, used to retell the story of Man's ascent from the Golden Age to the Age of Civilisation' (The Garden Book, PHAIDON). 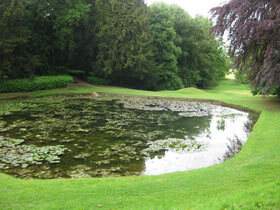 The Grand Tour (of Europe) inspired many Englishmen to adapt gardens as did William Kent who remodelled Rousham, Oxfordshire in 1738; here he included the famous serpentine rill which ends in a large octagonal pond. 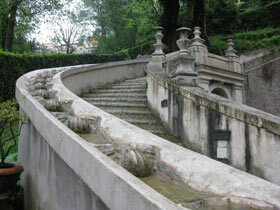 That the rill is curving shows how very different gardens were becoming. 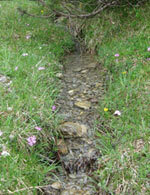 By 1906 Hestercombe, Somerset, displayed Arts-and-Crafts style water rills designed by Sir Edwin Lutyens and Gertrude Jeckyll: softer, less rigidly neat and planted within. Water features create a sensuous interaction with the garden, wonderful in a hot climate; a rill can be an intimate expression, and a fine proportion to a smaller garden.